Regular readers of this blog, if they existed, would know that for the past few years I’ve undertaken a photographic project during Lent. By this time of winter, I’m tired of being cooped up, and need some motivation to get out and shoot. The first project was in 2012, when I shot with only a single, fixed-length lens. In 2013, I designed postcards, some more serious than others. And last year I fired the shutter once and only once each day. This year, I’m pleased to announce that my dear friend K. Sekelsky, an illustrator and photographer, will be collaborating with me. We’re each going to shoot a roll of film in our cameras, then we’ll trade the exposed rolls and shoot them again. Each frame will be a double exposure created serendipitously by the two of us. 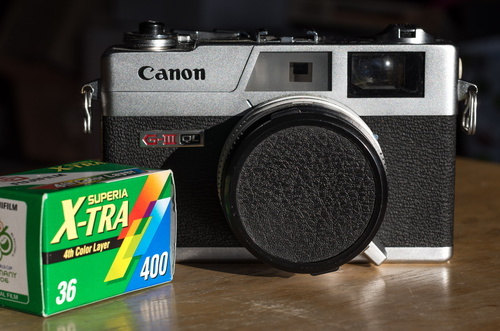 I’ve started with a roll of Superia 400 (“Process before 2007–6”) in my beloved Canonet QL17 GIII; she's got a roll of Reala 100 in her Holga 135. Because of the nature of this project, we won’t have anything to show you until after Easter, when we’ve had the film processed and had time to scan it and evaluate the results. Since the frames from our two cameras probably won’t line up, there will be some interesting creative decisions in how to present the finished work. I can’t wait to see what happens, and I hope you’ll be excited to see our results too!